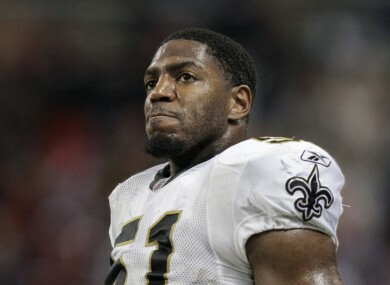 JONATHAN VILMA, SCOTT Fujita and Will Smith are back in the NFL. For now. The suspensions of those players, plus unsigned free agent Anthony Hargrove, for their roles in New Orleans’ pay-for-pain bounty scandal were lifted Friday by a three-member appeals panel. The Saints’ Smith and Fujita, now with the Cleveland Browns, probably will play in Sunday’s season openers. Vilma can at least rejoin teammates and coaches in New Orleans — and get paid — even if the linebacker is not yet ready to play because of knee problems. Still, there’s no telling how long the reprieve will last. NFL spokesman Greg Aiello said Goodell would “make an expedited determination of the discipline imposed” for violating the league’s bounty rule. “Until that determination is made, the four players are reinstated and eligible to play starting this weekend,” Aiello said. While the panel did not address the merits of the NFL’s bounty investigation, it found that Goodell overstepped his authority in hearing the players’ appeals of their punishments for participating in the Saints bounty program, which paid cash bonuses for hits that injured opponents. The panel’s decision states that Special Master Stephen Burbank, not Goodell, should discipline players for receiving money from a pool that paid for big plays. Goodell’s role, the panel said, should be limited to whether he can prove the players intended to injure opponents, which would fall in the category of conduct detrimental to the game. Players and coaches implicated in the bounty pool have testified under oath in a related federal court case they never intended to injure opposing players. The league’s investigation found that Saints coaches and players, led by former defensive coordinator Gregg Williams, ran a program from 2009-11 that offered cash payouts for hits that injured opponents. It said specific bounties were placed on quarterbacks Kurt Warner and Brett Favre in the 2009-10 playoffs. Vilma’s status was not as clear. His season-long suspension began before training camp and he has been trying to work his way back from offseason surgery on his left knee. Saints players had just finished practice when they received word of the panel’s ruling. At Browns headquarters, linebacker D’Qwell Jackson was sure the 33-year-old Fujita would be able to come back and have an immediate impact. “I’m confident Scott has been keeping his conditioning up and he knows the system,” Jackson said. Fujita was barred from Cleveland’s training facility this week, but he stayed in town and worked out on his own at nearby Baldwin Wallace University in the event the suspension was lifted. Fujita, who serves on the NFLPA’s executive committee, had expressed confidence he would be on the field in Week 1. The appeals panel consisted of retired federal Judge Fern Smith of San Francisco, retired federal Judge Richard Howell of New York, and Georgetown professor James Oldham. It met in New York last week to hear arguments from the NFL Players Association, which appealed Burbank’s ruling that Goodell had the authority to hear and rule on the players’ appeals of their suspensions. NFL attorneys had asked the panel to affirm Burbank’s ruling, but the panel sided in large part with the union. The Redzone: NFL is back, baby! Email “NFL: 'Bountygate' player bans lifted”. Feedback on “NFL: 'Bountygate' player bans lifted”.